"We must be mad" said Enoch Powell. We were and we remain mad. Today we hear of over 370,000 foreign Nationals paid benefits. This well put here. Yet our EU rulers would ensure we have many more to house, feed and nurse. How on this tainted Earth did this come about? My only answer is that the initial surge was based on saving the vast wealth of our privileged via back door deals when the empirical reach was chopped off. Despite the colonial wars and famous battles such as Rorke's drift, as ever, the cannon fodder was happily sacrificed to the greed of the senior upper echelons. Just as today we toil futilely in Afghanistan to the benefit of the likes of Reid and Hoon, amongst many others, profiting from war. Beyond all the facts and figures lies the abject surrender of our dead and maimed from endless wars. Those sacrifices were not for some horrendous super state, governed by unelected despots. The Balkanization of the UK is well under way. If the Scots think Independence is coming they're as mad as we all were back in the 60 and since. The watering down is creating a society which will forever be a tinder box. One day those riots of 2011 will be seen as a skirmish prior to all out civil war.A war fought for the possession of these lands. A war in which the governing EU and its forces, drawn from everywhere and with no state allegiance, will support the immigrant fighters against the indigenous. This is the only possible future I can envisage. Not nice, is it? As in all such conflict the cruel nastiness will reign over the innocent, not the powerful. I posted this yesterday here. Not one comment. Not one. Is everybody asleep? Or just don't care? Well maybe not in my lifetime but everyone will one day. Far too late of course. If you do nothing else, watch the clip below. Listen as those prophetic words continue to tell us way back then where we were and still are heading. "Not one comment. Not one. Is everybody asleep? Or just don't care?" More likely most are too scared to reply these days. We know that communications are monitored and the merest suggestion of any "racist" thoughts can (and does) lead to a knock on the door, followed by ones DNA being harvested. I haven't watched your clip - I don't need to, as I've seen others by Mr Powell, and know he was perfectly correct. MD are you serious about the lack of comment? What a terrible indictment. Yet somehow I guess you are scarily correct. The MPs are bribed to keep their mouths shut madness isn't the word for it. How can you be sitting in some dump in Romania one day the next your given £25k a year and allowed to claim housing benefits in this stupid country. I mean could you not make this stuff up. Yet does anyone remember last year a British person had to come back from Spain and was told "you are not allowed to claim any benefits"
OR. It's those who live in England who are missing the boat. 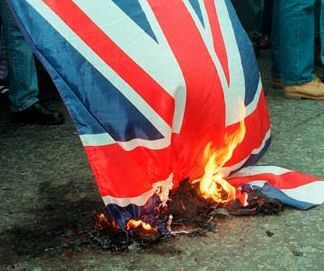 Why are the English not pursuing their own agenda? England has been a powerhouse in the world for many many years and it managed to be successful because England did it's own thing, pursued it's own aims and out competed every other power on the planet. It was also successful because it did not join the EU or any other similar type of remote control. Stand up England. Nothing will change unless you make it. Get Smart I suspect you are right and we are meant to be the dumping ground for the Merkozy EU. TT it is beyond me how awful things have become. One of the major issues is, of course, that stupidity of Socialist dogma, equality. I despair, I cannot believe how awful our country is now, why does no one (in government, MSM) tell the truth anymore. We're getting all of Europe's rubbish, I can see in the future, the UK will become an offshore prison, for all the unwanted, feral, nasty people from the continent, and us the people of this country will be living in getto's. I care very much OR, but I don't know what to do about it. I haven't voted Lab/Lib/Con for the past three elections. When I talk to groups of people about what worries me about how my country is changing they think I'm boring talking politics or a raving racist. I'm a lurker to your blog every day, other people tend to post more eloquently than I can, but I do agree with you. I am so glad I grew up in the 60s/70s when life was fun and I loved my country. John M and Ann Mary it really is so despairing. I post in order to give some small vent to my feelings and comments such as yours make it even more cathartic. Who knows, maybe somebody else might pick up on these feelings of despair who can actually do something. What I just don't know. What I don't understand is why this happens here? I lived in mainland Europe and you cannot simply arrive and claim the same benefits as the citizens, just try it and see. So why here? how come we have to do it and others don't? I am sort of glad I am getting old now as I hate what our country has become. I don't blame the people who come here, they would mad not to. So many freedoms we took for granted lost and soon our whole way of life. I despair too. OR, I didn't know about the other blog. There's some great stuff on it- perhaps linking to it more often may send people there. I think people genuinely think it couldn't happen again - that 'lessons have been learned' from what happened and that the benevolent EU has been created precisely to prevent it happening again. The majority believe that TPTB are trying their best to 'do the right thing', despite all evidence to the contrary. On the other hand I also think that the task of overthrowing the current order is too much for many people and that, although they know something is terribly, terribly wrong, they have no idea of how to change anything. Like you, I think the EU will go to any lengths to silence dissent once the gloves are well and truly off. At the moment they're still using takeover by stealth, even if some of it is becoming more overt. My advice to anyone would be to pretend you are in agreement with them and then get the hell out. If you have an overseas bank account or somewhere out of the UK to stash your wealth (gold, cash, other), then I'd start thenking about it. Start planning your exit and lets hope you never have to actually use your plan. Anon, I am grateful for your most supportive and well made post. It is a mystery how the UK is so generous and our European counterparts not. David, again support that makes the effort worthwhile. With regard to the Independent blog, I am anxious to avoid any hint of self promotion but am proud to be part of a Richard North venture. Thank you again for the input. Scotland is going to be independent. It may not be by a vote in 2014, but this issue ebbs and flows like the tide, and every few years the water gets higher up the beach. Partly you maybe cannot see what has become of your own country. The Capital and many of the other big cities are largely inhabited by newcomers. The white population, in decline by low birth rate anyway, is to be found in the suburbs and the countryside. So leafy wee towns like the PM's constituancy of Whitney have an entirely different ethnic makeup to his workplace. Scotland is still largely an exception. The Balkanization is that those Albanians are now a majority in your Serbian heartland. It may be too late for you to do something about it, but its not too late North of Hadrians wall. Anon, you underestimate your English cousins. As for Scottish independence, already an EU lick spittle. They covet your oil and subservience.